Late, as per usual, the Monday AFL press conference from Gillon McLachlan that was meant to be proactive on fixing an important matter ended up being an almighty fizzer. 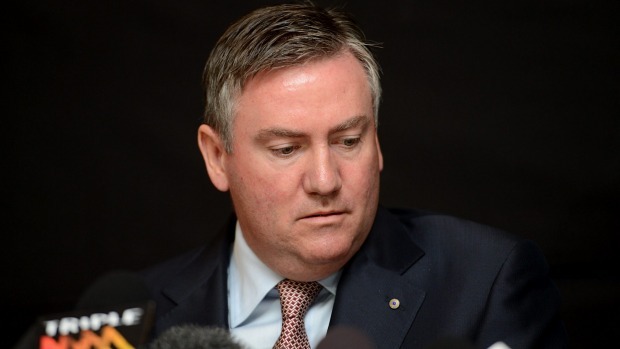 The Age football writer Caroline Wilson was the victim of a “joke” led and essentially orchestrated by Eddie McGuire, but was ignited by James Brayshaw – and it was cowardly, incredibly immature, and downright wrong, once you read the whole conversation. What was a golden opportunity for the AFL and the executive team to take a real stance against sexism, inappropriate comments and rude behaviour towards women in the game turned into a mumbling puddle of chaos. Exhibit A: McLachlan. The head of the AFL gave McGuire a “get-out-of-jail free” card, despite re-iterating the league would work on eliminating and changing the attitudes of all involved on the subject. Irony, anyone? McLachlan said McGuire’s apology was “legitimate and acceptable”. Acceptable, by the barest of margins, for the fact the Collingwood president took the time to apologise…but legitimate? Not a chance – it takes far more than simple words to fix a major sore. Unfortunately for Eddie, the original comments – paying $50,000 to see Wilson dunked and then kept under a pool of ice water – weren’t taken very well by fans. He also said they were made in “the spirit of the fun of the day”, but there seemed to be little spirit in what was termed “banter”. McLachlan also decided the media were to blame for not making these comments prevalent earlier, rather than having them air days later, saying it “was an indictment on everyone” – maybe some just didn’t know. “The fact the comments were made on radio and were not called out…the fact we can still argue this may have been done in jest shows a lack of understanding on this issue,” McLachlan said in his speech. That issue? Respecting the women involved in AFL – on or off the field. McGuire, Brayshaw and Danny Frawley were all in on the “banter”, ready to “jump” straight in and get involved. It paints an ugly picture, no other words need to be used. Despite McLachlan hammering home the fact that the AFL needs to take a bigger stance on stamping out such comments and actions, McGuire is going to face no punishment, even from radio station Triple M.
McLachlan also said “the women that I’m listening and speaking to feel that the apology was legitimate and acceptable.” That feels like a very big joke, because McLachlan wasn’t referring to Caroline Wilson, who very, very strongly threw it back in McGuire’s face, appalled at the attitude and “dismissal” of punishment. Be careful where you tread and what you say in the public domain these days. Since the comments, there have been many views and opinions on where this is going to go. However, we will get nowhere when people backpedal, and let situations like this slide. Action, please.